As family and friends of Gordon Baum, founder and CEO of the Council of Conservative Citizens (CCC), gather to lay him to rest, the future of one of the oldest and most influential hate groups in the United States remains uncertain. Baum, a former personal injury lawyer in the St. Louis area, formed the CCC in 1985 from the mailing lists of the White Citizens Councils of America (formally called the Citizens Councils of America). At the height of its influence, the CCC reached a membership of 15,000 with real political clout, including the membership of former Congressman Bob Barr (R-Ga.) and then-Senate Majority Leader Trent Lott (R-Miss.). The end of Baum’s 30-year tenure at the CCC leaves a major void at the heart of an organization for which he was the bedrock. But, in the wake of Baum’s passing, discord already has emerged. Just hours after Baum’s death, Kyle Rogers, the longtime Webmaster of the CCC’s website, published a brief obituary, which was then circulated on the white supremacist forum Stormfront. The post was taken down almost immediately, leading to widespread speculation that either the family had not approved its publication, or that Rogers had made a mistake. Rogers had not. The leadership confusion is not new. In recent years, a growing tactical divide has emerged within the CCC as the organization’s established old guard has become overshadowed by the new and more visible core of young activists who have become the face of the organization. Among them are Rogers and Brad Griffin of the blog Occidental Dissent, who is also Baum’s son-in-law. For Rogers, who also runs a website that sells apparel to hate groups, an increased leadership role in the CCC represents a significant financial opportunity. He has demonstrated business acumen by driving large amounts of traffic to the CCC website, while also quietly running ads for his personal business. But Griffin seems a more likely choice given his family ties to Baum and the prominence of his voice in the white nationalist movement as the primary author at his oft-cited website. In the past several years, Griffin also has appeared as a speaker at national conferences with increasing frequency. He has also positioned himself as a key young leader in the League of the South (LOS), a neo-confederate hate group that has strong ties and shared membership with the CCC. But even with such prominent voices, the succession plan for the CCC may not be clear cut. If either Rogers or Griffin hopes to successfully succeed Baum, they will have to displace several of the CCC’s most established members who have been waiting in the wings for years. These include A.J. 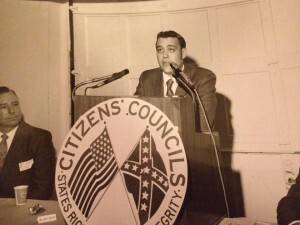 Barker, the CCC’s North Carolina chair. In 1988, Barker was a leader in the Populist Party, which backed David Duke, a rabidly anti-Semitic candidate with ties to the Ku Klux Klan, for president. And during a rally against the removal of the Confederate battle flag from the South Carolina capital in 1999, Barker, who was sharing a platform with Duke at the event, pilloried his black opponents. A fourth possible contender to lead the CCC is its Mississippi coordinator Bill Lord. Lord has publicly called cities with large, black populations, like Greenwood, Miss., “the Congo” and has argued for more local battles for “America’s future.” According to Lord, this should be done by “get[ting] you some bigots together and tak[ing] some organizations over.” He went on to suggest school boards as a target — something successfully accomplished in the late 1980s by another of Baum’s potential successors, Earl Holt. Holt, who serves on the CCC national advisory board, co-hosted a long-running radio show with Baum called “Right at Night.” After being elected to the St. Louis school board by running on an anti-busing platform, Holt lashed out via email against an Internet blogger who accused Holt and three other newly elected school board members as being white supremacists. Without a doubt, the CCC, which has seen its influence decline sharply in the past decade, finds itself at a critical juncture when deciding to place its future in the hands of its energetic but inexperienced young core or the steadfast members of its old guard. While its virulent racist voice promises to be a constant in any future version of the CCC, it remains to be seen whether the organization can survive the vacuum left in the absence of its founding pillar.